Not a review today. Our focus here will be a hack I stumbled upon that brings one of my favorite gel ink refills, the Energel by Pentel, together with the incredibly well-made Retrakt from Kustom Karas. 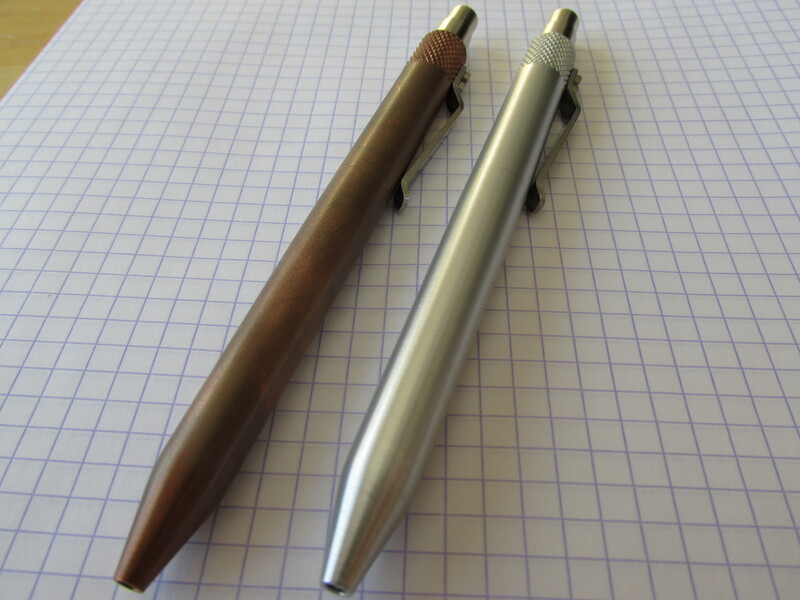 I have been wanting to get more use out of my Retrakt (actually, RetraktS plural as I have both the aluminum and copper models) but I haven’t found the right refill for the pen. That is, perhaps, until now. As you can see from the picture below, the Retrakt comes with its own kit that allows you to pair it with a wide range of refills. 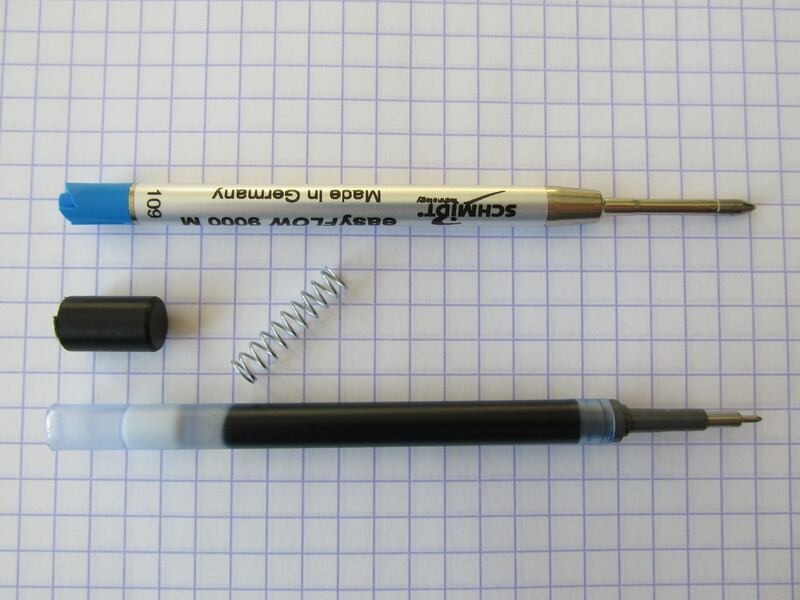 There are two differently sized springs, a short black plastic plug and a length of rigid plastic tubing. The different springs work with different refills. The black plastic plug allows the Retrakt to accommodate shorter Parker-style refills and the plastic tubing can be cut to size and paired with all sorts of other refills. Out of the box, the Retrakt works with the Pilot G2 refill without any of the paraphernalia seen here save for the wider spring. Of course the G2 refill is great and works well for most folks in most situations. However, as a lefty, the dry time on the G2 isn’t ideal and so the search was on to find another option. Dry times 0.7 gels fastest to slowest: Energel < Signo 207 = Zebra Sarasa < Pilot G2. Checked on Rhodia, Post-It and Exacompta index. Yes, I could just put one of the trillion or so Parker-style refills in the Retrakt and call it a day but the pen is such as precision built tool that going with a ballpoint or hybrid ink refill just didn’t seem like the way to go – enter the Energel 0.5 mm refill from Pentel. I recently did a multiple pen review for many things Energel, so I’ve had Energel on the brain for the past few days. The aforementioned review focused on the various Pentel options that take the 0.7 mm Energel refill, but there is also reasonably easy to find 0.5 mm Energel optional as well. It seemed to me that the fast-drying Energel with the more precise 0.5 mm line and the machined Retrakt would make a nice pairing. However, a bit of hacking is needed to make it work. 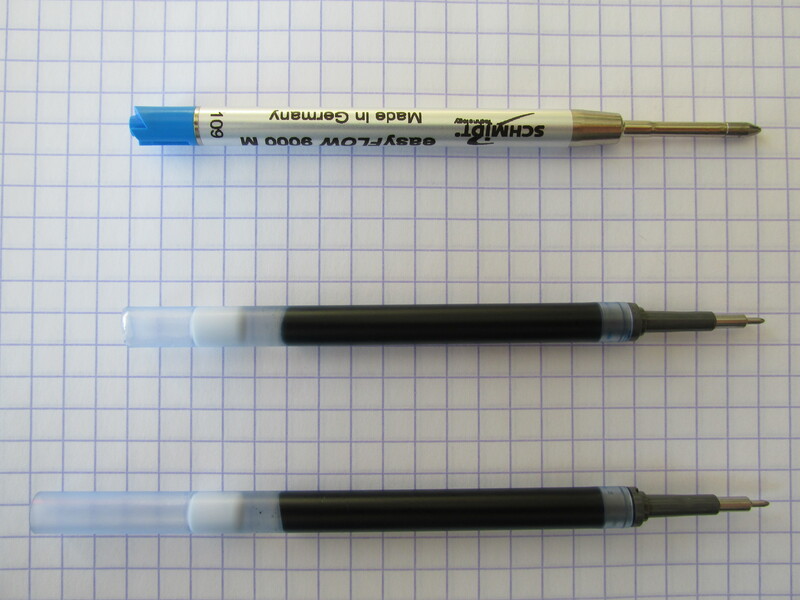 Below you can see an unmodified Energel refill, a Parker-style refill (a Schmidt Easyflow 9K to be exact) and the cut-to-size Energel. The unmodified Energel refill will fit into the Retrakt but the problem is that it will not deploy. 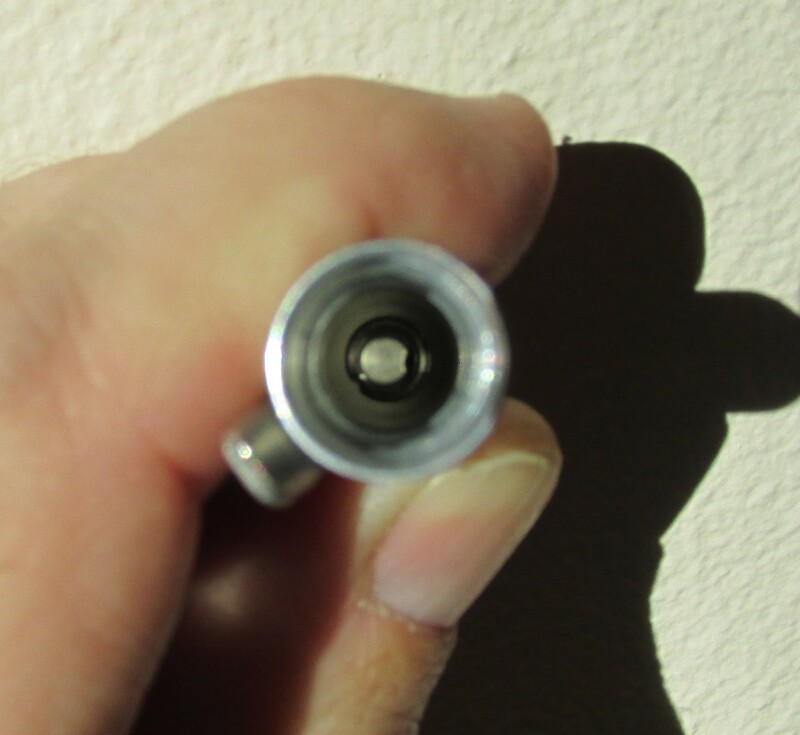 You see, the end of the Energel refill is open and the interior of the button mechanism of the Retrakt consists of a thin medal rod that slides into the open-ended refill instead of pushing it out. I managed to get a decent shot of the end of the metal rod inside the Retrakt by holding the top section in the bright sun. Here’s where a bit of creativity and the black plastic thingy come into play. 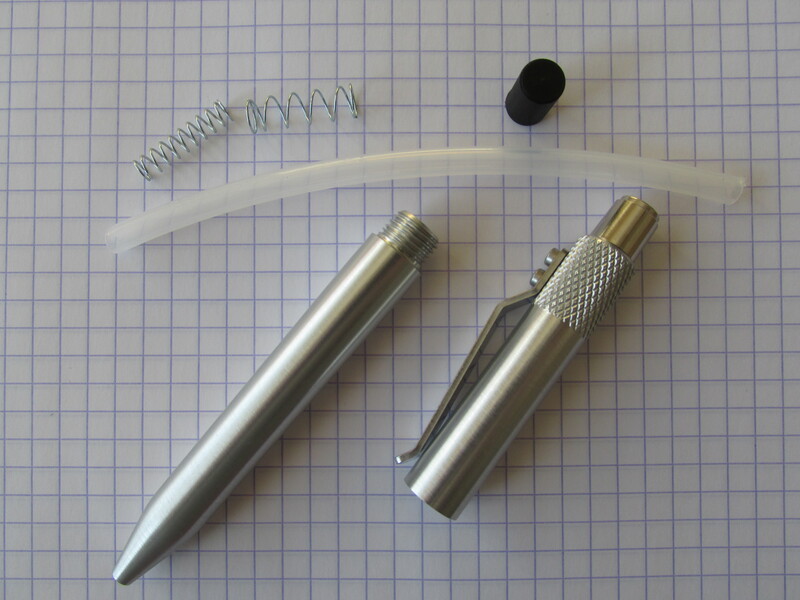 Simply cut the Energel refill to the length of the Parker-style refill and load the modified refill with the black plastic plug in the top section of the Retrakt. Top off the refill with the thinner of the two springs and its all systems go! When deployed, the 0.5 mm tip does not extent as far out from the Retrakt as it does from the Pentel Energel Deluxe RT. I wish it extended just another millimeter or so but that’s just me being way too picky. Next time, I’ll leave the refill just a tad longer after the cut. While I don’t have a picture, the tip does fully retract and it does not appear that bleeding from the undeployed tip will be an issue. To test this possibility, I pressed the tip of the pen firmly onto a pad of paper with the refill retracted and did not see any evidence of ink leaving the refill. Importantly, the button action is every bit as smooth and consistent with the modified Energel as it is with a Parker-style refill. So, there we have it. 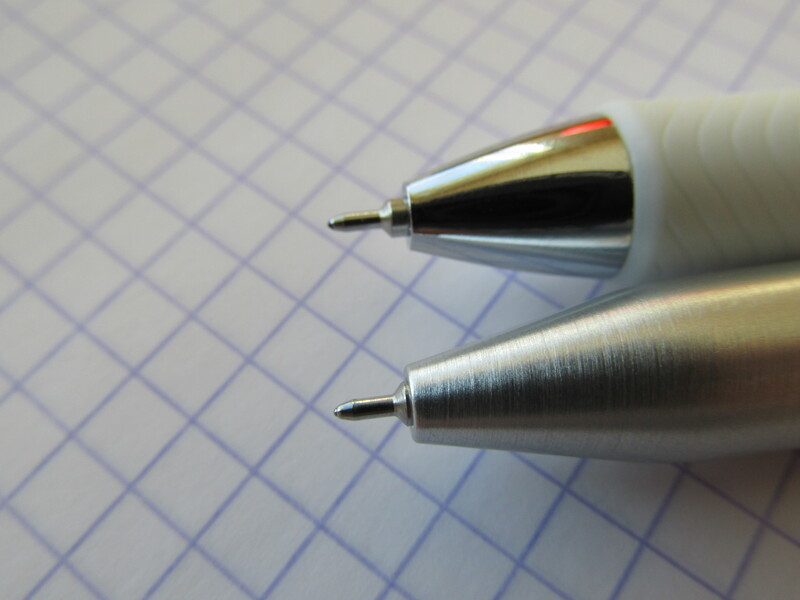 A precision writing instrument with a precision refill. As a bonus for reading this far, here are a couple more pictures of the two Retrakts I have. If you look closely, you might be able to see a bit of the green patina on the copper Retrakt. Cool stuff. Posted on 02/24/2014 by Todd	This entry was posted in Gel and tagged Energel, Karas Kustom, Retrakt. Bookmark the permalink. You can unscrew the thrust device from the top of the pen in case you want a better picture. Thanks so much!! I was getting very frustrated trying to get the Energel to work, now I know how !! I went with a Fisher Refill in Fine blue for now. Yes it does. 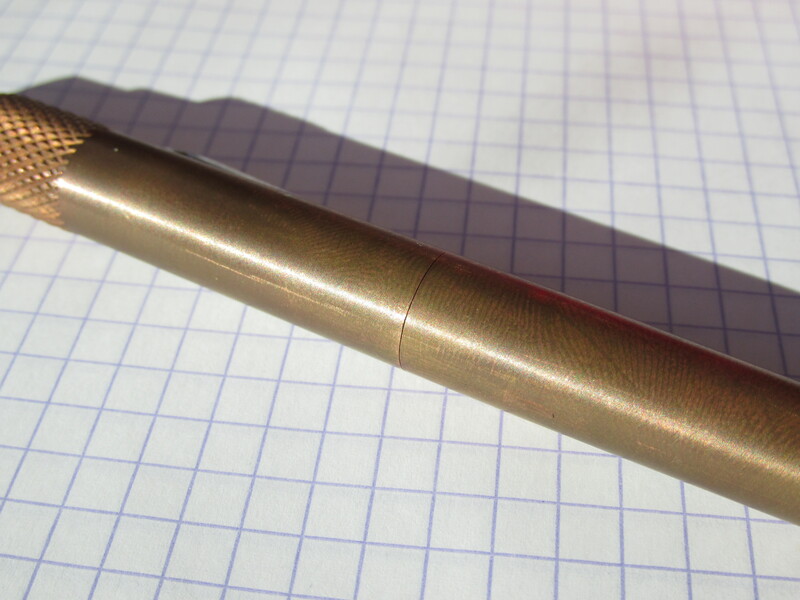 The bit of wiggle in various refills is one of the reasons why I have cooled on machined pens a bit. you know I was using the bigger spring on mine. I did switch it out and it seems a whole lot better. Now there is a small gap but not enough to drive me nuts. has anyone figured out a hack for the hitec-c or hitec coleto?